ShindaiSat is a 20kg satellite launched on February 27th 2014 at 18:37 UTC on the H-IIA launch vehicel #23 (H-IIA F23) along with the GPM satellite. Its orbit is a 407km circular orbit with an inclination of 65 degrees. 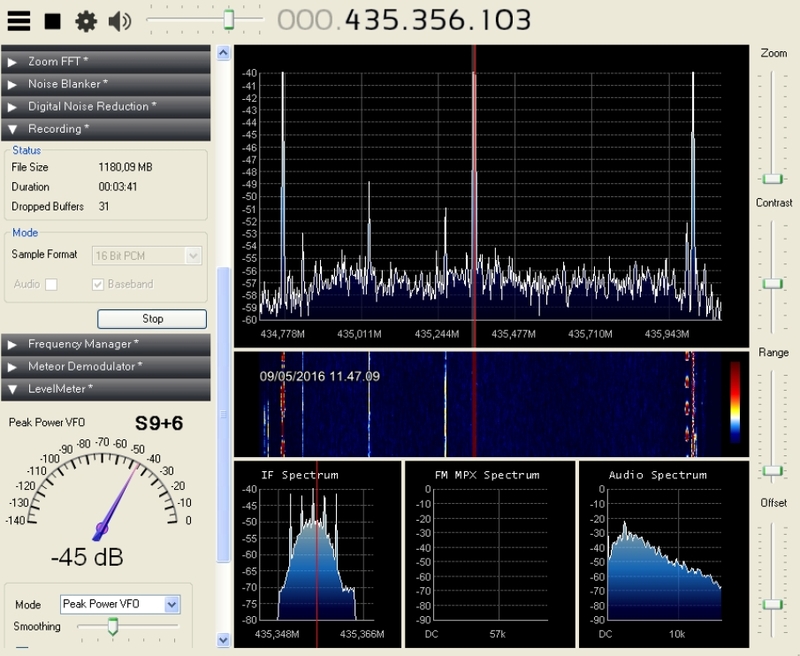 ShindaiSat transmits on 437.525 MHz a AX.25 1200bd AFSK signal. In addition it features a CW beacon on 437.305 MHz. It also will transmit and receive light signals. The LED beacon signal will use Morse Code. ShindaiSat-1 is operational. On May 3rd 2014 Davide IW0HLG received the CW signal of ShindaiSat. Recording kindly provided by Davide IW0HLG. ITF-1 is a 1U cubesat built by students at the University of Tsukuba. The designated callsign is JQ1ZLO. It was launched on February 27th 2014 at 18:37 UTC on the H-IIA launch vehicel #23 (H-IIA F23) along with the GPM satellite. Its orbit is a 407km circular orbit with an inclination of 65 degrees. ITF-1 transmits on 437.525 MHz a morse code signal in FM modulation. Unfortunately the mission was unsuccessful: no signals from the spacecraft were ever received. ITD-1 YUI re-entered the Earth's atmosphere on June 29th 2014. OPUSAT was launched on February 27th 2014 at 18:37 UTC on the H-IIA launch vehicel #23 (H-IIA F23) along with the GPM satellite. Its orbit is a 407km circular orbit with an inclination of 65 degrees. OPUSAT transmits on 437.150 MHz either a AX.25 1200bd AFSK or a AX-25 9600bd GMSK signal. OPUSAT is operational. On April 19th 2014 Davide IW0HLG received the CW signal of OPUSAT. Recording kindly provided by Davide IW0HLG. TeikyoSat-3 was launched on February 27th 2014 at 18:37 UTC on the H-IIA launch vehicel #23 (H-IIA F23) along with the GPM satellite. Its orbit is a 407km circular orbit with an inclination of 65 degrees. TeikyoSat-3 transmits on 437.450 MHz a AX.25 1200bd AFSK signal. In addition it features a CW beacon on 437.450 MHz. Teikyosat-3 is operational. Mike DK3WN received the CW signal of TeikoSat-3 on March 3rd 2014 at 16:20 UTC. Recording kindly provided by Mike DK3WN. ARTSAT INVADER was launched on February 27th 2014 at 18:37 UTC on the H-IIA launch vehicel #23 (H-IIA F23) along with the GPM satellite. The callsign of this Japanese Cubesat is JQ1ZKK. Its orbit is a 407km circular orbit with an inclination of 65 degrees. ARTSat-1 Invader transmits on 437.200 MHz either a AX.25 1200bd AFSK signal or operates as a FM digitalker. In addition it features a CW beacon on 437.325 MHz. ARTSAT INVADER was fully operational until it decayed on September 2nd 2014. This recording includes the CW beacon and at the end the first voice message received from the digitalker of ARTSAT INVADER on February 28th 2014. Recording kindly provided by Akihiro Kubota-san on behalf of the ARTSAT project team. On March 29th 2014 the digitalker of CO-77 transmitted a synthesized English voice message "Stay Hungry". Recording kindly provided by Akihiro Kubota-san on behalf of the ARTSAT project team. On May 21st 2014 the digitalker of CO-77 transmitted a synthesized voice message meaning in English "Love and Peace". Recording kindly provided by Akihiro Kubota-san on behalf of the ARTSAT project team. The digitalker downlink of INVADER was received on May 22nd 2014 at 18:34 UTC by Mike DK3WN. The synthesized voice message is "Kooichiha Uchu" (in English "Hello Space". Recording kindly provided by Mike DK3WN. Also Jan PE0SAT received the digitalker of INVADER at the same time. Recording and spectrum plot kindly provided by Jan PE0SAT. On August 25th 2014 the digitalker of CO-77 transmitted a synthesized voice message meaning in English "Goodbye Space". Recording kindly provided by Akihiro Kubota-san on behalf of the ARTSAT project team. On August 27th 2014 the digitalker of CO-77 transmitted a synthesized voice message meaning in English "Forever Invader". Recording kindly provided by Akihiro Kubota-san on behalf of the ARTSAT project team. STARS-II (Space Tethered Autonomous Robotic Satellite-2) is a nanosatellite technology demonstration project from Kagaa University in Japan. It consists of a mother-daughter satellite configuration communicating through Bluetooth. STARS-II (mother) was launched on February 27th 2014 at 18:37 UTC on the H-IIA launch vehicel #23 (H-IIA F23) along with the GPM satellite. Its orbit is a 407km circular orbit with an inclination of 65 degrees. STARS-II (mother) transmits on 437.405 MHz AX.25 1200bd AFSK signal. In addition it features a CW beacon on 437.245 MHz. STARS-II M is operational. Davide IW0HLG received the CW signal of STARS-II Mother. Recording kindly provided by Davide IW0HLG. Mike DK3WN received the CW signal of STARS-II Mother on March 6th 2014 at 18:07 UTC. Recording kindly provided by Mike DK3WN. STARS-II (Space Tethered Autonomous Robotic Satellite-2) is a nanosatellite technology demonstration project from Kagaa University in Japan. It consists of a mother-daughter satellite configuration communicating through Bluetooth. STARS-II (daughter) was launched on February 27th 2014 at 18:37 UTC on the H-IIA launch vehicel #23 (H-IIA F23) along with the GPM satellite. Its orbit is a 407km circular orbit with an inclination of 65 degrees. STARS-II (daughter) transmits on 437.425 MHz a AX.25 1200bd AFSK signal. In addition it features a CW beacon on 437.255 MHz. STARS-II D is operational. LitSAT-1 was successful deployed from ISS by Astronaut Koichi Wakata KC5ZTA using a Nanoracks deployment pod and is operational. 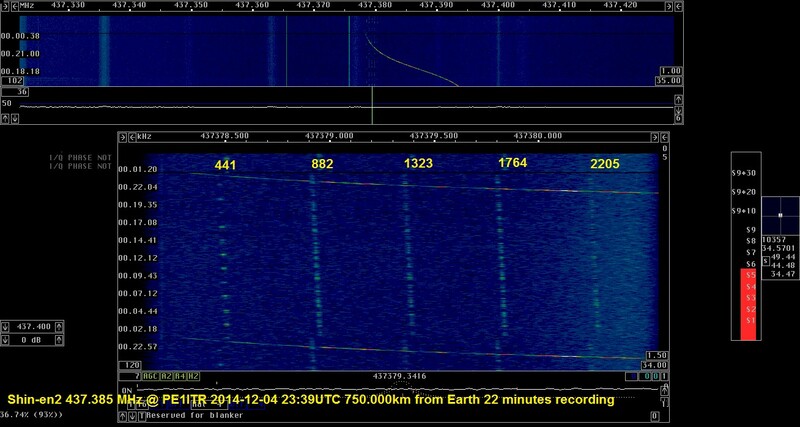 LitSat-1 was heard last time in the morning of May 21st 2014 and decayed on May 22nd 2014. Enclosed pulsed AX.25 signal was received on March 1st 2014 at 11:10 UTC on 145.850 MHz by DD1US. LituanicaSAT-1 is together with LitSat-1 one of the two the first Lithuanian satellites. The Kaunas University of Technology developed LituanicaSAT-1 with members of the Vilnius University Amateur Radio Club being involved. The satellite used low cost open-source software and hardware for primary and secondary flight computers that controlled the payload consisting of an onboard VGA camera, GPS receiver, UHF CW beacon 100mW, 9k6 AX25 FSK telemetry TX 2 watts and FM Mode V/U transponder 150mW Voice Repeater. - CW Beacon 437.275 MHz. LituanicaSAT-1 was successful deployed from ISS by Astronaut Koichi Wakata KC5ZTA using a Nanoracks deployment pod and is operational. LituanicaSat-1 decayed on July 28th 2014. Enclosed signal of the FM transponder including his own signal was received on May 1st 2014 at 23:15 UTC on 145.850 MHz by Roland PY4ZBZ. Recording kindly provided by Roland Zurmely PY4ZBZ. This QSO between PU2NGB and PY5LF was recorded on June 5th 2014 during orbit #1522 by Roland PY4ZBZ. Recording kindly provided by Roland Zurmely PY4ZBZ. Roland PY4ZBZ recorded himself calling CQ on July 1st 2014. Recording kindly provided by Roland Zurmely PY4ZBZ. Roland PY4ZBZ recorded enclosed QSO between himself and PY5LF on July 22nd 2014. At the end you can hear also the beacon signal in CW and as a female voice identifying the callsign LY5N. Recording kindly provided by Roland Zurmely PY4ZBZ. SPROUT is a Japanse Cubesat with a weight of 7.1 kg. It was launched piggyback on ALOS-2 (Advanced Land Observing Satellite - 2) on May 24th 2014 at 03:05 UTC from Tanegashima Space Center into a sun synchronous orbit with a height of 654km. The first who reported the reception of the CW beacon was Roland PY4ZBZ. He received it on May 24th 2014 at 04:00 UTC. Recording kindly provided by Roland Zurmely PY4ZBZ. The output power is approx. 400mW. Davide IW0HLG received the 1200bd BPSK signal of EO-79 on July 21st 2014 at 09:51 UTC on 145.815 MHz. Recording and waterfall plot kindly provided by Davide IW0HLG. Francisco EA7ADI received the 1200bd BPSK signal of EO-79 on March 1st 2015 at 10:02 UTC. Recording kindly provided by Francisco EA7ADI. Davide IW0HLG received the 1200bd BPSK signal of EO-80 on July 22nd 2014 at 09:36 UTC on 145.880 MHz. Recording and waterfall plot kindly provided by Davide IW0HLG. Francisco EA7ADI received the 1200bd BPSK signal of EO-80 on April 11th 2015 at 10:07 UTC. Recording kindly provided by Francisco EA7ADI. Francisco EA7ADI received the 1200bd BPSK signal of EO-80 also on April 26th 2015 at 10:23 UTC. Recording kindly provided by Francisco EA7ADI. - AMSAT’s FUNcube-2, an outreach payload allowing school children of primary and secondary age to interact with the spacecraft. It features a CW downlink on 145.830 MHz, a telemetry downlink at 145.915 MHz as well as a 435 MHz / 145 MHz linear transponder. Davide IW0HLG received the CW signal of UKube-1 on December 12th 2014 at 21:30 UTC on 145.480 MHz. Recording and waterfall plot kindly provided by Davide IW0HLG. Davide IW0HLG received the 1200bd BPSK signal of FunCube-2 on December 13th 2014 at 09:52 UTC on 145.915 MHz. Recording and waterfall plot kindly provided by Davide IW0HLG. Francisco EA7ADI received the CW signal of UKUBE-1 on April 2nd 2015 at 10:34 UTC. Recording kindly provided by Francisco EA7ADI. Francisco EA7ADI received the CW signal of UKUBE-1 again on May 9th2015 at 10:38 UTC. Recording kindly provided by Francisco EA7ADI. Line A is a Communications experiment with an uplink at 145.942 MHz and a downlink at 435.270 MHz (0.4 Watts). The modulation format is F1D (10bps, FSK, manchester encoded). Line C is the Command up and downlink to control the operation of the spacecraft. Uplink is in 2m band (F2D, AFSK)) and downlink is at 437.385 MHz (0.8 Watts) in F1D (FSK). The satellite will orbit the sun in an elliptic orbit between Venus and Mars. Its inclination will stay almost zero. Rob Hardenberg received the signal from Shin-en2 on December 4th 2014 at 23:39 UTC on 437.385 MHz. At that time Shin-en2 was at a distance of 750 000 km. Spectrum plot kindly provided by Rob PE1ITR. Rob Hardenberg received the signal from Shin-en2 also on December 3rd 2014 at 22:01 UTC on 437.377 MHz. Audio recording kindly provided by Rob PE1ITR. ARTSAT - DESPATCH (ART and SATellite Project - DEep SPace Amateur Troubadour’s CHallenge) was launched with Hayabusa-2 from Japan on Dec. 3rd 2014 on an Earth escape trajectory. This spacecraft is 50x50x45 cm in size , has a mass of 32 kg and has a helix-shaped segment making it a beautiful sculpture. ARTSAT is also called Fuji OSCAR 81 and features a 7 Watt CW beacon transmitting on 437.325 MHz. Rob Hardenberg received the signal from ARTSAT-2 on December 4th 2014 at 00:00 UTC on 437.3179 MHz. At that time ARTSAT-2 was at a distance of 730 000 km. Spectrum plot kindly provided by Rob PE1ITR. Enclosed audio file of ARTSAT-DESPATCH was recorded on December 3rd 2014 at 16:45 UTC while Artsat-Despatch was at a distance from Earth of 200 000 km. You can hear the telemetry downlink signal in very slow baudot coding. Recording kindly provided by Akihiro Kubota-san on behalf of the ARTSAT project team. This is another recording of the telemetry signal of ARTSAT-DESPATCH recorded about one hour later on December 3rd 2014 at 17:40 UTC. Recording kindly provided by Akihiro Kubota-san on behalf of the ARTSAT project team. LightSail-1 is a 3U cubesat with a weight of 5 kg. It has a 9600 bps FSK AX.25 Packet Radio downlink on 437.435 MHz using the callsign KK6HIT. Lightsail became operational but had 2 failures which resulted in a loss of communication in the first 2 weeks. However it came back again each time. The deployment of the solar cells was successful. The deployment of the solar sail started on June 7th 2015 at 19:47 UTC. Lightsail-1's reentry occurred on July 15th 2015 around 17:23 UTC near the South Atlantic Ocean. Mike DK3WN received the 9600bd signal of LightSail-1 on June 10th 2015 at 05:50 UTC. Recording kindly provided by Mike DK3WN. The PSAT Project (ParkinsonSAT) has been developed by students at the US Naval Academy Satellite Lab as a two-way communications transponder system that could be used to relay data from remote terminals to a global network of internet linked ground stations. The PSAT-1 satellite hosts an AX.25 Packet Radio Relay system based on the Automatic Packet Reporting System using the standard VHF 145.825 MHz frequency for up and downlink. PSAT-1 is based on the 1.5U form factor using solar cells for power generation and a 10-Watt-hour battery. In addition to the APRS system, the PSAT spacecraft is equipped with a PSK31 transponder that allows multi-user access to the satellite. This text messaging transponder can allow messaging between 30 ground stations simultaneously. The PSK31 uplink for PSat-A is at 28.120MHz (SSB), the corresponding downlink is at 435.350MHz (FM with PSK31 subcarriers) with the telemetry at the subcarrier of 315 Hz. Francisco EA7ADI received the AX-25 packet radio downlink of PSAT-1 on 145.825 MHz on May 30th2015 at 08:30 UTC. Recording kindly provided by Francisco EA7ADI. Francisco EA7ADI received the PSK31 downlink of PSAT-1 on 435.350 MHz on May 31st2015 at 17:12 UTC. He used a ICOM IC-7000 and a home made 7 element cross YAGI antenna. Recording and spectrum plot kindly provided by Francisco EA7ADI. NO-83 BRICsat-P (Ballistic Reinforced Communication Satellite) is a low cost 1.5U CubeSat built by the US Naval Academy Satellite Lab in collaboration with George Washington University. Its main mission is to demonstrate on-orbit operation of a Micro-Cathode Arc Thruster (µCAT) electric propulsion system. In addition it carries an Amateur Radio communication payload. The PSK31 uplink for BRICsat is at 28.120MHz (SSB), the PSK downlink is at 435.350MHz (FM with PSK31 subcarriers) with the telemetry at the subcarrier of 375 Hz. BRICsat also features a 9600 bps FSK AX.25 Packet Radio telemetry downlink on 437.975 MHz which transmits every 20 seconds. BRICSAT telemetry has been heard but is cycling OFF due to low power. Mike DK3WN received the 9600bd telemetry signal of NO-83 on June 30th 2015 at 18:30 UTC. Recording kindly provided by Mike DK3WN. During the same pass on June 30th 2015 at 18:30 UTC Mike DK3WN received also the PSK31 downlink signal of NO-83 . Recording kindly provided by Mike DK3WN. CAS-3A to CAS-3I were launched on a Long March 6 (CZ-6) rocket on September 19th 2015 at 23:01:14 UTC. Click on the picture below to get an enlarged frequency band plan of XW-2A to XW-2F. This is waterfall diagram showing the various downlink signals of the CAS-satellites. The diagram was recorded on September 22nd 2015 at 17:21 UTC. Please ignore the interference signal at 145.860 MHz. CAS-3A is a micro-satellite with the dimensions 398mmx398mmx398mm and a mass of approx. 25 kg. The CW beacon of CAS-3A was received on September 20th 2015 at 16:04 UTC on 145.662 MHz in USB. Recorded by Matthias DD1US. The GMSK downlink of CAS-3A was received on September 20th 2015 at 16:05 UTC on 145.641 MHz in USB. Recorded by Matthias DD1US. Francisco EA7ADI received the CW downlink of XW-2A on 145.660 MHz on September 25th2015 at 18:17 UTC. Recording kindly provided by Francisco EA7ADI. Francisco EA7ADI received the CW downlink of XW-2A on 145.660 MHz on September 27th2015 at 17:46 UTC. Recording kindly provided by Francisco EA7ADI. On December 27th 2015 at 21:37 UTC the 19k2 downlink signal of XW-2A was received and recorded by Noguchi-san JA5BLZ. Recording kindly provided by Tetsu-san JA0CAW. CAS-3A to CAS-3I were launched on a Long March 6 (CZ-6) rocket on September 19th 2015 at 23:01:14 UTC. CAS-3B is a micro-satellite with the dimensions 246mmx246mmx246mm and a mass of approx. 10 kg. The CW beacon of CAS-3B was received on September 20th 2015 at 16:07 UTC on 145.728 MHz in USB. Recorded by Matthias DD1US. The GMSK downlink of CAS-3B was received on September 20th 2015 at 16:06 UTC on 145.705 MHz in USB. Recorded by Matthias DD1US. On November 30th 2015 at 21:15 UTC the 19k2 downlink signal of XW-2B was received and recorded by Kuge-san JE1CVL. Recording kindly provided by Tetsu-san JA0CAW. CAS-3A to CAS-3I were launched on a Long March 6 (CZ-6) rocket on September 19th 2015 at 23:01:14 UTC. CAS-3C is a micro-satellite with the dimensions 246mmx246mmx246mm and a mass of approx. 10 kg. The CW beacon of CAS-3C was received on September 20th 2015 at 16:07 UTC on 145.790MHz in USB. Recorded by Matthias DD1US. The CW beacon of CAS-3C was received on September 20th 2015 at 17:42 UTC on 145.788 MHz in USB. Recorded by Matthias DD1US. The GMSK downlink of CAS-3C was received on September 20th 2015 at 16:08 UTC on 145.770 MHz in USB. Recorded by Matthias DD1US. Francisco EA7ADI received the CW downlink of XW-2C on 145.790 MHz on September 24th2015 at 16:54 UTC. Recording kindly provided by Francisco EA7ADI. On December 22nd 2015 at 23:24 UTC the 19k2 downlink signal of XW-2C was received and recorded by Noguchi-san JA5BLZ. Recording kindly provided by Tetsu-san JA0CAW. CAS-3A to CAS-3I were launched on a Long March 6 (CZ-6) rocket on September 19th 2015 at 23:01:14 UTC. CAS-3D is a micro-satellite with the dimensions 246mmx246mmx246mm and a mass of approx. 10 kg. The CW beacon of CAS-3D was received on September 20th 2015 at 16:09 UTC on 145.853 MHz in USB. Recorded by Matthias DD1US. The GMSK downlink CAS-3D was received on September 20th 2015 at 16:09 UTC on 145.835 MHz in USB. Recorded by Matthias DD1US. 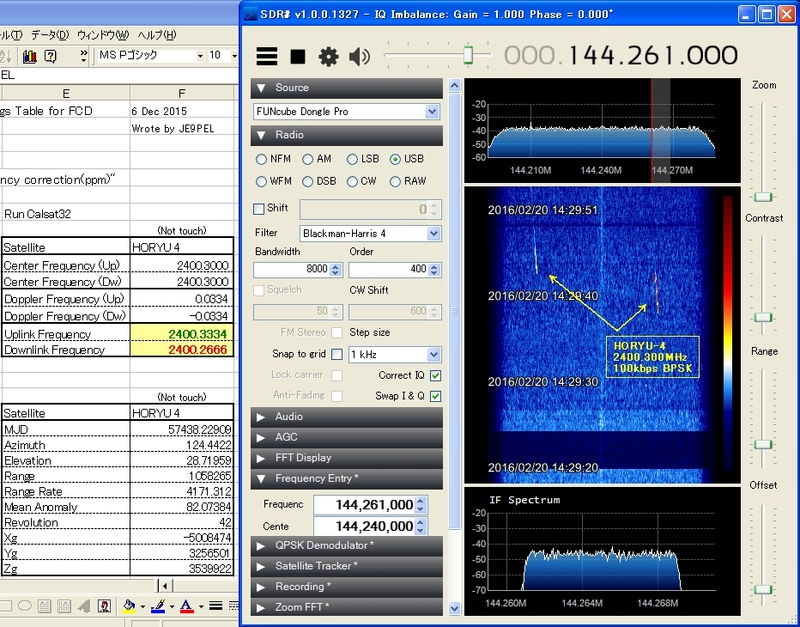 On December 26th 2015 at 21:20 UTC the 19k2 downlink signal of XW-2D was received and recorded by Noguchi-san JA5BLZ. Recording kindly provided by Tetsu-san JA0CAW. CAS-3A to CAS-3I were launched on a Long March 6 (CZ-6) rocket on September 19th 2015 at 23:01:14 UTC. CAS-3E is a picosatellite with the dimensions 116mmx116mmx116mm and a weight of approx. 1.5kg. The CW beacon of CAS-3E was received on September 20th 2015 at 16:10 UTC on 145.907 MHz in USB. Recorded by Matthias DD1US. The GMSK downlink of CAS-3E was received on September 20th 2015 at 16:11 UTC on 145.886 MHz in USB. Recorded by Matthias DD1US. The linear transponder downlink of CAS-3E was received on September 20th 2015 at 17:41 UTC on 145.931 MHz in USB. You can hear F4EJN calling CQ. Recorded by Matthias DD1US. Francisco EA7ADI received the CW downlink of XW-2E on 145.910 MHz on September 25th2015 at 18:28 UTC. Recording kindly provided by Francisco EA7ADI. Francisco EA7ADI received the CW downlink of XW-2E on 145.910 MHz on September 27th2015 at 18:02 UTC. Recording kindly provided by Francisco EA7ADI. CAS-3A to CAS-3I were launched on a Long March 6 (CZ-6) rocket on September 19th 2015 at 23:01:14 UTC. CAS-3F is a picosatellite with the dimensions 116mmx116mmx116mm and a weight of approx. 1.5kg. The CW beacon of CAS-3F was received on September 20th 2015 at 16:13 UTC on 145.972 MHz in USB. Recorded by Matthias DD1US. The linear transponder downlink of CAS-3F was received on September 20th 2015 at 17:40 UTC on 145.990 MHz in USB. You can hear EA1GM calling CQ. Recorded by Matthias DD1US. Francisco EA7ADI received the CW downlink of XW-2F on 145.975 MHz on September 27th2015 at 18:08 UTC. Recording kindly provided by Francisco EA7ADI. CAS-3A to CAS-3I were launched on a Long March 6 (CZ-6) rocket on September 19th 2015 at 23:01:14 UTC. CAS-3G is a 2U Cubesat which was ejected from its mother satellite Xinjishu Yanzheng 2 on September 20th 2015. The GMSK downlink of CAS-3G was received on September 20th 2015 at 17:37 UTC on 145.475 MHz in FM. Recorded by Matthias DD1US. Francisco EA7ADI received the 9k6 GMSK downlink of DCBB on 145.475 MHz on September 30th2015 at 17:20 UTC. He demodulated the signal in USB and FM. 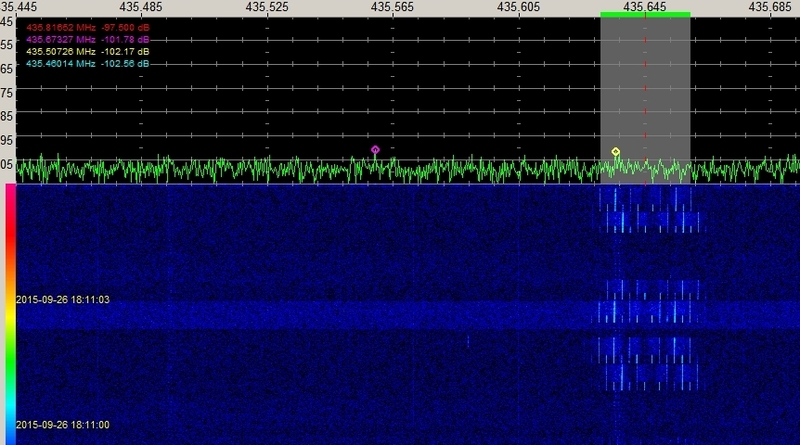 First half of enclosed recording of the downlink signal was in USB, second half in FM. Kindly provided by Francisco EA7ADI. LilacSat-2 was launched on a Long March 6 (CZ-6) rocket on September 19th 2015 at 23:01:14 UTC. CAS-3H is a low cost nano-satellite with the dimensions 200mmx200mmx200mm and a weight of approx. 11kg. The GMSK downlink of CAS-3H was received on September 20th 2015 at 17:43 UTC on 437.200 MHz in FM. Recorded by DD1US. 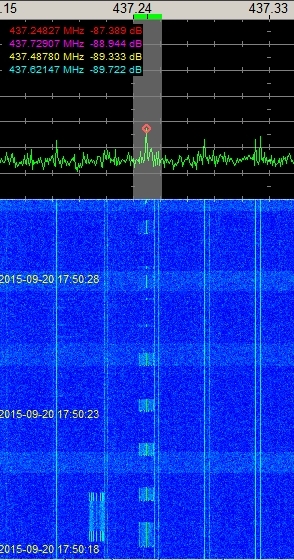 On the transponder downlink on 437.246 MHz enclosed signal was received on September 20th 2015 at 17:50 UTC in USB. It is most likely someone testing the transponder. 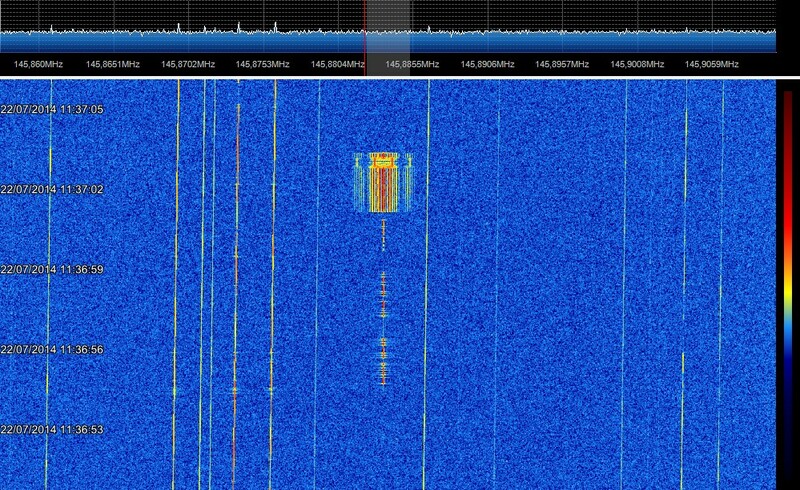 Left to the FM transponder downlink you can also see one burst of the beacon signal. Recorded by DD1US. 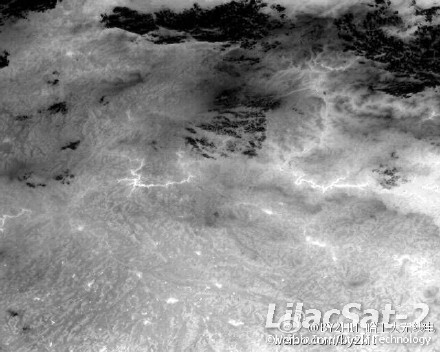 On September 24th 2015 student team at Harbin Institute of Technology downloaded the first infrared image taken by LilacSat-2. CAS-3A to CAS-3I were launched on a Long March 6 (CZ-6) rocket on September 19th 2015 at 23:01:14 UTC. CAS-3I is an experimental pico satellite with a weight of 1kg developed by NUDT (National University of Defense Technology) and CAMSAT. Francisco EA7ADI received the 9k6 FSK downlink of NUDT-Phone-Sat on 437.300 MHz on September 27th2015 at 17:50 UTC. Recording kindly provided by Francisco EA7ADI. A Chinese 2U Cubesat lanuched into a 470km x 485km orbit with an inclination of 97.3°. Telemetry downlink is 435.645 MHz GMSK 4800/9600 CSP, TX interval 10 sec. It is planned to demonstrate formation flying with inter satellite communication using GAMALINK 2.4 GHz spread spectrum at 1Mbps and CSP (CubeSat Space Protocol). On the telemetry downlink on 435.645 MHz enclosed signal was received on September 26th 2015 at 18:11 UTC in FM. One can see that there are 2 downlink signals, most likely from TW-1A and TW-1C. 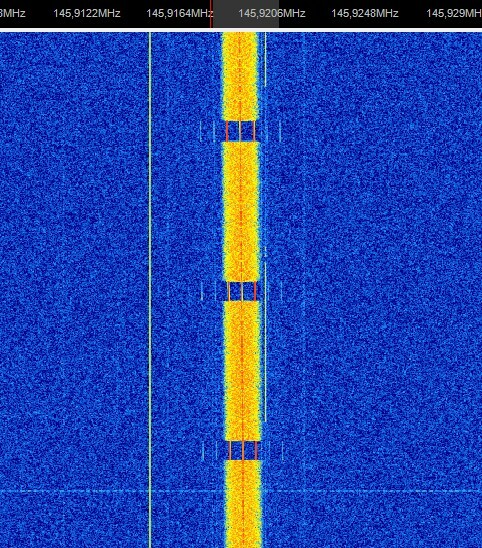 The short time offset between the transmissions suggests that the 2 satellites are communicating with each other. Recorded by DD1US. Francisco EA7ADI received the 4800/9600bd GMSK signal of TW-1A on July 5th 2016 at 19:15 UTC on 435.645 MHz. Recording kindly provided by Francisco EA7ADI. Jan PE0SAT received the 9600bd GMSK downlink signal of TW-1A on September 24th 2016 at 16:55 UTC on 435.650 MHz. Recording kindly provided by Jan van Gils PE0SAT. A Chinese 2U Cubesat lanuched into a 470km x 485km orbit with an inclination of 97.3°. Telemetry downlink is 437.645 MHz GMSK 4800/9600 CSP, TX interval 20 sec. A Chinese 3U Cubesat lanuched into a 470km x 485km orbit with an inclination of 97.3°. Telemetry downlink is 435.645 MHz GMSK 4800/9600 CSP, TX interval 10 sec. Francisco EA7ADI received the 9k6 GMSK signal of TW-1C on February 10th 2016 at 19:47 UTC on 435.645 MHz. He used an IC7000 receiver in USB mode and a 2x6 element cross yagi. Recording kindly provided by Francisco EA7ADI. Jan PE0SAT received the 9600bd GMSK downlink signal of TW-1C on September 25th 2016 at 07:43 UTC on 435.636 MHz. Recording kindly provided by Jan van Gils PE0SAT. LAPAN-A2 satellite was launched together with AstroSat by an Indian PSLV-C30 rocket into a 650km high orbit with an inclination of 6 to 8 degree. Thus it crosses the territory of Indonesia 14 times a day. LAPAN A2, also known as LAPAN-ORARI, is an indonesian microsatellite with a weight of 74 kg. It is a successor of LAPAN-Tubsat and the structure and many subsystems are the same as in its sister satellite LAPAN A3. It carries an AIS (Automatic Identification System) to identify the ships in the waters of Indonesia and a video camera with a range three times wider than the Lapan-Tubsat. It also carries a payload for disaster management by amateur radio communication. The Earth observation payload of LAPAN A2 consists of a Video camera (Kappa PAL) for 80 km width ground coverage and a Video camera (Kappa HDTV) for high resolution satellite color video observation with a ground resolution of 6 m and a ground coverage of 11 × 6 km per video frame. LAPAN-A2 carries a payload of voice repeaters and an APRS repeater on 145.825 MHz for communications of the Organisation for Amateur Radio Indonesia (ORARI) during a disaster. The APRS repeater is using the callsign YBOX-1. The S-Band downlink at 2220 MHz provides the video signal a data rate of 5 Mbps. The UHF downlink is at 437.425 MHz and provides TT&C (telemetry tracking and command) functions at a data rate of 1200bd. The command uplink is also in the UHF band. IO-86 features a FM voice repeater with an uplink at 145.880 MHz (using a 88,5 Hz CTCSS tone) and a downlink at 435.880 MHz. PY5LF received IO-86 on May 6th 2017 at 16:10 UTC. Recording was kindly provided by Luciano PY5LF. AAUSat-5 was built by the Aalborg University in Denmark. This 1U Cubesat features a 9k6 GMSK and CW downlink on 437.425 MHz. AAUSat-5 decayed on March 15th 2016. After its successful launch from ISS first signals were reported on October 5th 2015. Mike DK3WN received the 9k6 GMSK signal of AAUSAT-5 on October 9th 2015 at 19:10 UTC. Recording kindly provided by Mike DK3WN. GomX-3 was built by the Aalborg University in Denmark. This 3U Cubesat features a 4k8 bps GMSK downlink on 437.250 MHz using CSP custom frame data packets with an interval of <10 sec. The data rate may be changed to up to 19k2 bps. The transmit power is 1 Watt. It also features an X-band transmitter with a data rate of 3 Mbps. After its successful launch from ISS on October 5th 2015 Roland PY4ZBZ received GomX-3 at 14:36 UTC. Recording and spectrum plot kindly provided by Roland Zurmely PY4ZBZ. Francisco EA7ADI received the 9k6 GMSK signal of GOMX-3 on February 2nd 2016 at 17:45 UTC on 437.250 MHz. He used an IC7000 receiver in USB mode and a 2x6 element cross yagi. Recording kindly provided by Francisco EA7ADI. FOX-1A is a 1U 1kg Cubesat featuring an UV-FM-Transponder with an uplink frequency of 435.180 MHz and a downlink frequency of 145.980 MHz. Please note that 67 Hz CTCSS tone is to be used in up- and downlink. The telemetry beacon transmits with 200 bps approx. 300Hz below the audio spectrum. The satellite will also test a MEMS Gyro and a low energy proton experiment. It was successfully launched as part of the GRACE (Government Rideshare Advanced Concepts Experiment) auxiliary paypload on the NROP-55 mission from Vandenburg AFB in USA on an Atlas V vehicle on October 8th 2015. Signals from FOX-1A were reported already shortly after launch. On the downlink on 145.980 MHz enclosed synthesized voice signals were received on October 8th 2015 at 20:47 UTC in FM, then SSB, then FM. The signal was weak as I was using an omni antenna but one can still hear the voice output identifying the satellite as "FOX One". Recorded by DD1US. On October 9th 2015 at 17:54 UTC the FM transponder was active and quite some activity was audible including F5VKV calling CQ and having some QSOs. Recorded by DD1US. Francisco EA7ADI received the FM voice downlink signal of FOX-1A on February 10th 2016 at 19:31 UTC on 145.980 MHz. Recording kindly provided by Francisco EA7ADI. On July 2nd 2016 at 19:08 UTC Francisco EA7ADI received the FM Digital Voice Downlink of FOX-1A on 145.980 MHz. Recording kindly provided by Francisco EA7ADI. Horyu-4 was built by students at the Kyushu Institute of Technology in Japan. Its is anArc Event Generation and Investigation Satellite (AEGIS). Its primary mission is testing in space high voltage solar array technology and studying in space electro-static discharge phenomenon. HORYU is a project-based learning platform, and through practical satellite design, development, and testing the involved students study systems engineering. Its uplink is at 437.375 MHz (1200bd AFSK) and the downlink is at 2400.300 MHz (9600bd GMSK). The becaon at 437.375 MHz is transmitting CW and BPSK. Wakita-san JE9PEL received the 1200bd AFSK downlink signal of Horyu-4 on February 18th 2016 at 10:28 UTC on 437.375 MHz. Recording kindly provided by Wakita-san JE9PEL. Wakita-san JE9PEL received the CW beacon downlink signal of Horyu-4 on February 19th 2016 at 10:28 UTC on 437.375 MHz. Recording kindly provided by Wakita-san JE9PEL. Wakita-san JE9PEL received the 100kbps BPSK downlink signal of Horyu-4 on February 20th 2016 at 05:22 UTC on 2400.300 MHz. Recording kindly provided by Wakita-san JE9PEL. On April 3rd 2016 Wakita-san JE9PEL received the DigiSinger audio downlink signal of Horyu-4 on 437.375 MHz. HORYU-4 played the sound "Japanese Flag". Recording kindly provided by Wakita-san JE9PEL. Also on April 8th 2016 Wakita-san JE9PEL received the DigiSinger audio downlink signal of Horyu-4 on 437.375 MHz. HORYU-4 played the sound "Japanese Flag". Recording kindly provided by Wakita-san JE9PEL. On April 8th 2016 Wakita-san JE9PEL received the DigiSinger audio downlink signal of Horyu-4 on 437.375 MHz. HORYU-4 played the sound "Japanese Nathional Anthem Kimigayo". Recording kindly provided by Wakita-san JE9PEL. On April 9th 2016 Wakita-san JE9PEL received the DigiSinger audio downlink signal of Horyu-4 on 437.375 MHz. HORYU-4 played the sound "2001 A Space Odyssey". Recording kindly provided by Wakita-san JE9PEL. On May 23rd 2016 from 09:34 until 09:46 UTC Wakita-san JE9PEL received agaiin the 2.4 GHz downlink signal. Enclosed recording and spectrogram of the upper BPSK sideband on 2400.300 MHz + 50kHz was kindly provided by Wakita-san JE9PEL. Francisco EA7ADI received the CW beacon of HORYU-4 on July 7th 2016 at 18:45 UTC on 437.375 MHz. Recording kindly provided by Francisco EA7ADI. ChubuSat-2, so-called Kinshachi 2, is the second satellite of ChubuSat, a series of 50 kg-class microsatellite, following ChubuSat-1. The size is about 50 cm cubic, and the weight is about 50 kg. It was selected with ChubuSat-3 as one of the piggy-back payloads of the X-ray astronomical satellite ASTRO-H. It was developed in collaboration among Nagoya University, Daido University, and aerospace industrial small and medium-sized companies. It features a UHF CW beacon at 437.100 MHz and a VHF/UHF Store-and-Foreward payload. The uplink is at 145.815 (or 145.840 MHz the published data is not clear) and the downlink is at 437.100 MHz in 9k6 GMSK. The callsign is JJ2YPN. ChubuSat-3 is a 50kg-class microsatellite built by Nagoya University. In 2014, ChubuSat-3 was selected as one of the piggy-back payload of H-IIA launch vehicle. The primary mission of ChubuSat-3 is to observe the situation of the global warming such as reduction of the glacier or retreat of the shoreline. For this mission, ChubuSat-3 has a high resolution camera. A secondary mission is to observe space debris. It features a UHF CW beacon at 437.425 MHz and a VHF/UHF Store-and-Foreward payload. The uplink is at 145.840 MHz in 1k2 AFSK and the downlink is at 437.425 MHz in 9k6 GMSK. The callsign is JJ2YPO. Luciano PY5LF received the CW beacon downlink signal of Chubusat-3 on February 18th 2016 on 437.416 MHz. Recording kindly provided by Luciano PY5LF. AAUSAT-4, E-st@r-II and OUFTI-1 are 1U CubeSats launched on Monday, April 25th at 21:02 UTC on a Russian Soyuz-STA Fregat-M rocket from Kourou / French Guyana. They are secondary payloads to the Earth Observation Satellite Sentinel-1B. The three CubeSats were developed by student teams under the European Space Agency (ESA) Education Office “Fly Your Satellite!” program, which is aimed at training the next generation of aerospace professionals. OUFTI-1 was built by the University of Liege in Belgium and will be the first satellite to carry a DSTAR Digital Voice Transponder. It transmits on 145.950 MHz FSK and D-STAR with the corresponding D-STAR uplink at 435.045 MHz. Its CW beacon transmits on 145.980 MHz. Francisco EA7ADI received the CW beacon signal of OUFTI-1 on April 27h 2016 at 18:10 UTC on 145.980 MHz. Recording kindly provided by Francisco EA7ADI. On May 2nd 2016 at 16:35 UTC Peter ON4EZJ received the CW beacon of OUFTI-1 on 145.9725 MHz. Recording kindly provided by Peter ON4EZJ. AAUSAT-4, E-st@r-II and OUFTI-1 are 1U CubeSats launched on Monday, April 25th at 21:02 UTC on a Russian Soyuz-STA Fregat-M rocket from Kourou / French Guyana. They are secondary payloads to the Earth Observation Satellite Sentinel-1B. The three CubeSats were developed by student teams under the European Space Agency (ESA) Education Office “Fly Your Satellite!” program, which is aimed at training the next generation of aerospace professionals. E-st@r-2 was built by the Polytechnic of Turin in Italy and will demonstrate an attitude control system measurements of the Earth's magnetic field. It will transmit on 437.825 MHz in CW and 1200bd AFSK. 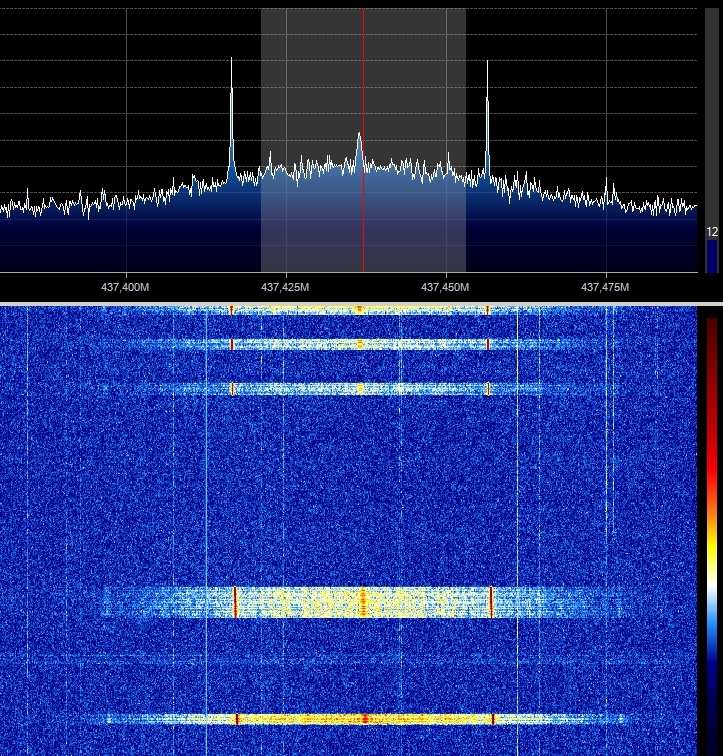 The signal from the e-st@r satellite 1200 bps beacon is very weak which may indicate an antenna deployment issue or unexpectedly low transmit power. Roland PY4ZBZ recorded the CW beacon of E-st@r-2 on May 4th 2016 at 21:15h UTC on 437.485 MHz. Recording and audiogram kindly provided by Roland Zurmely PY4ZBZ. AAUSAT-4, E-st@r-II and OUFTI-1 are 1U CubeSats launched on Monday, April 25th at 21:02 UTC on a Russian Soyuz-STA Fregat-M rocket from Kourou / French Guyana. They are secondary payloads to the Earth Observation Satellite Sentinel-1B. The three CubeSats were developed by student teams under the European Space Agency (ESA) Education Office “Fly Your Satellite!” program, which is aimed at training the next generation of aerospace professionals. AAUSAT-4 was built by the University of Aalborg in Denmark and operates an automated ocean vessel identification system. It transmits on 437.425 MHz using the callsign OZ4CUB. Francisco EA7ADI received the CW beacon of AAUSAT-4 on June 21st 2016 at 18:08 UTC on 437.425 MHz. Recording kindly provided by Francisco EA7ADI. Francisco EA7ADI received the CW beacon of AAUSAT-4 on June 22nd 2016. Recording kindly provided by Francisco EA7ADI. Mineo Wakita, JE9PEL, received the 2400bd GFSK downlink signal on 437.425 MHz of AAUSAT-4 on August 28th 2017 at 10:47 UTC. Recording kindly provided by Wakita san JE9PEL. AIST-2D is a technology demonstration and scientific research satellite developed at Samara Aerospace University in cooperation with satellite manufacturer TsSKB-Progress. It has a weight of 531 kg and was launched together with RS 48 (SamSat 218D). One of the 8 payloads on board is a P-band radar BiRLK, that can transmit 200 W pulses in the 435 MHz band with a bandwidth of 1 - 30 MHz. 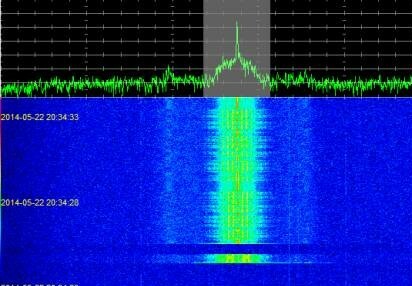 AIST-2D transmits telemetry on 435.315 MHz, identifying itself as 'RS 48'. Enrico IW2AGJ recorded the bacon of AIST-2D on May 9th 2016 at 09:43h UTC during orbit #171 on 435.3561 MHz in FM. Recording and spectrum kindly provided by Enrico IW2AGJ. On April 28th 2016 at 02:01 UTC, the Russian 3U cubesat SamSat 218D (aka 'Kontakt-Nanosputnik') was launched from the new Russian satellite launch base 'Vostochny' ('Eastern') in eastern Siberia. SamSat 218D was built at the Samara State University. Together with CADRE also MinXSS-1 (Miniature X-Ray Solar Spectrometer) was deployed on May 16th 2016 at 10:05 UTC. This 3U CubeSat was built by scientists and engineers at the University of Colorado, Boulder and the Laboratory for Atmosheric and Space Physics (LASP). Over 40 graduate students, 3 undergraduate students and one high school student have worked on MinXSS. It will transmit 9600bd FSK signals on 437.345 MHz. Francisco EA7ADI received the 9600bd FSK signal of MINXSS on July 10th 2016 at 10:10 UTC on 437.345 MHz in FM. Recording kindly provided by Francisco EA7ADI. Together with MinXSS-1 also CADRE (Cubesat investigating Atmospheric Density Response to Extreme driving) was deployed on May 16th 2016 at 10:05 UTC. This 3U CubeSat was built by the University of Michigan. It will transmit 9600bd FSK signals on 437.485 MHz and feature also a downlink at 3404 MHz. A Slow Scan TV (SSTV) CubeSat developed by students at Saint Thomas More Cathedral School (STM) in Arlington, VA, was deployed from the International Space Station on May 16th 2016 at 14:40 UTC. STM is thought to be the first Elementary school to build their own satellite, even Pre-Kindergarten, Kindergarten, and First Grade students were involved in the project. The satellite, a 1U CubeSat called STMSat-1, will transmit a SSTV Robot36 mode signal in FM modulation on 437.800 MHz. Together with STMSAT-1 also two NODES cubesats (NODES-1 and NODES-2) were deployed on May 16th 2016 at 14:40 UTC. These 1U CubeSats were built by students at Santa Clara University and will demonstrate inter satellite communication. They will transmit 1200bd AFSK signals on 437.100 MHz and 115.2kbps spread spectrum FSK signals in the range of 2401.2...2431.2 MHz. Francisco EA7ADI received the 1200Bd AFSK beacon of NODES-1 on June 25th 2016 at 09:48 UTC on 437.100 MHz. Recording kindly provided by Francisco EA7ADI. Francisco EA7ADI received the 1200Bd AFSK beacon of NODES-2 on June 22nd 2016 at 17:20 UTC on 437.100 MHz. Recording kindly provided by Francisco EA7ADI. The Argentinian earth observation satellite ÑuSat-1 was launched on a CZ-4B rocket from Taiyuan Satellite Launch Center in China on May 30th 2016 at 03:17 UTC into a 500 km sun-synchronous orbit with an inclination of 97.5 degrees and a Local Time of the Ascending Node (LTAN) of 10:30. This first satellite of a constellation of 25 has the dimensions of 40 cm × 43 cm × 75 cm and a mass of 37 kg. The spacecraft is equipped with an imaging system operating in visible light and infrared. The constellation will allow for commercially available real-time Earth imaging and video with a ground resolution of 1 m. The satellite was developed based on the experience gained on the BugSat 1 (Tita) prototype satellite. An S/X transponder with 2 W of output power for 8 GHz downlink and 2 GHz uplink will be operating on 100 kHz bandwidth. For backup telemetry, designers are considering an UHF transponder operating at 9k6 GFSK. ÑuSat-1, also called LUSEX-OSCAR 87 (LO-87), carries a linear transponder built by AMSAT Argentina. The inverting U/V transponder, named LUSEX (LU satellite experiment), has an uplink of 435.935 MHz to 435.965 MHz and a downlink of 145.935 MHz to 145.965 MHz. Total power output is 250 mW. There is also a CW beacon at 145.900 MHz with a power output of 70 mW. 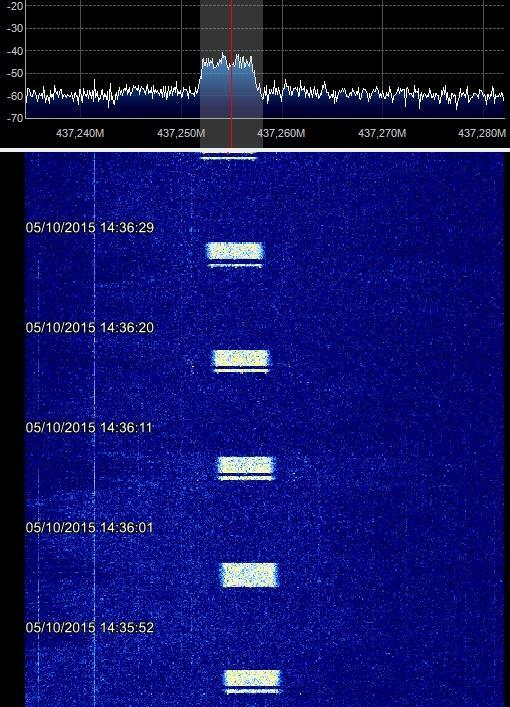 NuSat-1 also features a GFSK telemetry beacon at 436.445 MHz. Luciano PY5LF received the transponder downlink signal of LO-87 on February 14th 2017 at 13:10 UTC on 145.953 MHz. Recording kindly provided by Luciano PY5LF. Mineo Wakita, JE9PEL, received the 40kbd GFSK telemetry downlink signal on 436.445 MHz of NUSAT-1 on September 23rd 2017 at 19:22 UTC. Recording kindly provided by Wakita san JE9PEL. Together with NuSat-1 also NuSat-2 was launched. It features a GFSK telemetry beacon operating at 437.445 MHz. Jan PE0SAT received the GFSK downlink signal of NuSat-2 on June 1st 2016 at 21:09 UTC on 437.438 MHz. He provided an I/Q-File which I demodulated in FM to hear the pulses and I generated also enclosed spectrum display. Recording kindly provided by Jan van Gils PE0SAT. Sathyabamasat is a 2U cubesat with a weight of 1.5 kg. The spacecraft is designed to measure the densities of the green house gases over the region in which it moves on using ARGUS 1000 IR Spectrometer payload. The payload is operated (switched ON) over the regions where we are interested, and it delivers the data to the On-Board Computer (OBC) for transmission, when it crosses the radio window of ground station, which is being built in Sathyabama University premises, Chennai, India. Francisco EA7ADI received the 1200Bd FFSK beacon of LAPAN-A3 on July 6th 2016 at 09:24 UTC on 437.325 MHz in FM. Recording kindly provided by Francisco EA7ADI. The Firebird payload of the BIROS satellite determines the position and selected fire parameters of already active or newly emerging fires, like temperature, energy, and surface area. The data is transmitted directly to mobile devices. To make that possible the image data are processed already on board and the results are sent over a special modem as an “SMS”. Besides an optical laser downlink it features also an UHF/S-Band downlink. The UHF downlink operates at 437.525 MHz, mode 4800 bps GMSK using the Mobitex protocol. BIROS will deploy BEESAT-4 some weeks after the launch of BIROS. BEESAT-4 is a 1U cubesat built by Technische Universität Berlin. BEESAT-4 was deployed by BIROS on September 9th 2016. The CW beacon using the callsign DP0BEH was activated at 12:41 UTC. Jan PE0SAT received the CW beacon as well as the 4800bd GMSK downlink signal of BeeSat-4 on September 9th 2016 at 18:42 UTC on 435.9577 MHz. Recording kindly provided by Jan van Gils PE0SAT. Also on September 12th 2016 at 10:12 UTC Jan PE0SAT received the 4800bd GMSK downlink signal of BeeSat-4 on 435.9589 MHz. Recording kindly provided by Jan van Gils PE0SAT. The Maritime Monitoring and Messaging Microsatellite (M3MSat) developed by COM DEV Ltd. and SFL was successfully launched on Polar Satellite Launch Vehicle PSLV-C34 from Sriharikota, India. Swayam-1 was developed by students at the College of Engineering Pune (COEP). it will provide a text messaging facility using the COEPSAT protocol. Its downlink is at 437.025 MHz. The beacon frequency is 437.025 MHz. The mode is 1200 bps BPSK and CW. Francisco EA7ADI received the CW beacon of SWAYAM on June 23rd 2016 at 09:57 UTC on 437.025 MHz. Recording kindly provided by Francisco EA7ADI. Also on June 25th 2016 at 09:23 UTC Francisco EA7ADI received the CW beacon of SWAYAM on 437.025 MHz. Recording kindly provided by Francisco EA7ADI. This 6U Cubesat named Cube-Cat-Two built by Universitat Politecnica des Catalunya in Barcelona/Spain. The weight is 7kg. It was launched together with QSS on August 15th 2016 from Jiquan, PRC, on a Long March 2D rocket into a 485km x 503km orbit with an inclination of 97.4 degree. Jan PE0SAT received the 9600bd BPSK downlink signal of 3CAT-2 on August 24th 2016 at 23:55 UTC on 145.970 MHz. Recording kindly provided by Jan van Gils PE0SAT. AlSat-1N is a 3U cubesat built in collaboration between the Algerian Space Agency (ASAL), UK Space Agency (UKSA), Surrey Space Centre (SSC) and Algerian students. It was launched on the Indian PSLV-C35 mission . It features a 9600bpsk FSK downlink on 437.650 MHz. Jan PE0SAT received the 9600bd BPSK downlink signal of AlSat-1N on September 23rd 2016 at 12:08 UTC on 437.519 MHz. Recording kindly provided by Jan van Gils PE0SAT. Also IW2AGJ received the BPSK downlink of AlSat-1N on 437.645 MHz on December 27th 2016 at 10:06 UTC. Spectrum plot kindly provided by Enrico IW2AGJ. Jean-Pierre F5YG received the CW beacon during Pratham's orbit #43 on September 29th 2016 on 145.980 MHz. Recording kindly provided by F5YG. CAS-2T (Dream 1) is a technical verification satellite for CAMSAT CAS-2 series amateur radio satellites. Developed by middle school students with the support of China's Academy of Launch Vehicle Technology, the Science and Technology Museum, and the Eastern Highlands Qian Youth Space Sciences Organization, the 2U CubeSat carries a ham radio 145/435 MHz FM transponder. CAS-2T was intentionally not separated from the final stage of rocket CZ-11(Y2). The final stage was originally expected to be in orbit for up to 30 days before re-entering the Earth’s atmosphere but reports indicate the orbit is 504 x 1030 km which could give an orbital lifetime of several years. Luciano PY5LF received the CW beacon downlink signal of CAS-2T on November 23rd 2016 at 21:00 UTC on 435.710 MHz. Recording kindly provided by Luciano PY5LF. STARS-C (Space Tethered Autonomous Robotic Satellite) , built by Shizuoka University in Japan, was deployed from ISS using JSSOD (Kibo module) on Dec. 19th 2016 at 08:30 UTC. After it was released by ISS the satellite did split in two satellites, mother and daughter which are connected by a 100 meter long tether. STARS-C is based on a 2U cubesat structure with a weight of 2.7kg. The mission of this satellite is to explore space elevator technology. The data of the experiment will be sent to Earth using Amateur Radio frequencies and Radio Amateurs around the world will help to collect the scientific data. Francisco EA7ADI received the CW beacon signal of STARS-C mother on January 6th 2017 at 10:45 UTC. Recording kindly provided by Francisco EA7ADI. BY70-1 (Bayi kepu weixing 01 xing) is a Chinese satellite which was developed by high school students at the PLA-related Bejing Bayi School. It was launched on December 28th 2016 at 03:23 UTC from Taiyuan launch center on a Long March 2D launch vehicle. Unfortunately the launch was not successful and thus BY70-1 did not reach the target circular orbit with an altitude of 520 km. Instead the satellite is an elliptical orbit with an apogee of 524km and a perigee of 213km. Thus the lifetime of the satellite will be very limited. BY70-1 carries an FM transponder with the uplink frequency of 145.929 MHz and the downlink frequency of 436.200 MHz. A CTCSS tone with 67 Hz has to be used. There seems to be a delay of the downlink versus uplink of up to 0.5 seconds. In addition BY70-1 also feature a 9k6 telemetry downlink on 436.200 MHz sending packet bursts every 30 seconds. BY70-1 decayed on February 18th 2017. The FM transponder of BY70-1 was revceived and recorded on December 31st 2016 at 09:32 UTC by IW2AGJ. You can hear a nice QSO between F4DXV and 9A2EY on the downlink frequency of 436.209 MHz. Recording and spectrum plot kindly provided by Enrico IW2AGJ. Enclosed recording of the 9k6 telemetry downlink on 436.200 MHz was made on December 28th 2016 at 11:20 UTC and kindly provided by .Tetsu-san JA0CAW. Francisco EA7ADI received the FM transponder downlink of BV70-1 on January 2nd 2017 at 10:58 UTC. You can hear the special call II0IAAR calling CQ. Recording kindly provided by Francisco EA7ADI.